William Raymond Grimshaw was born in New Jersey in 1892 and lived in Tulsa, Oklahoma by 1920, when he was recorded in the U.S. Census. He operated W.R. Grimshaw Construction Company in Tulsa, which built several prominent buildings in the area, including the Will Rogers Museum in Claremore in 1938 and the Tulsa Public Library. 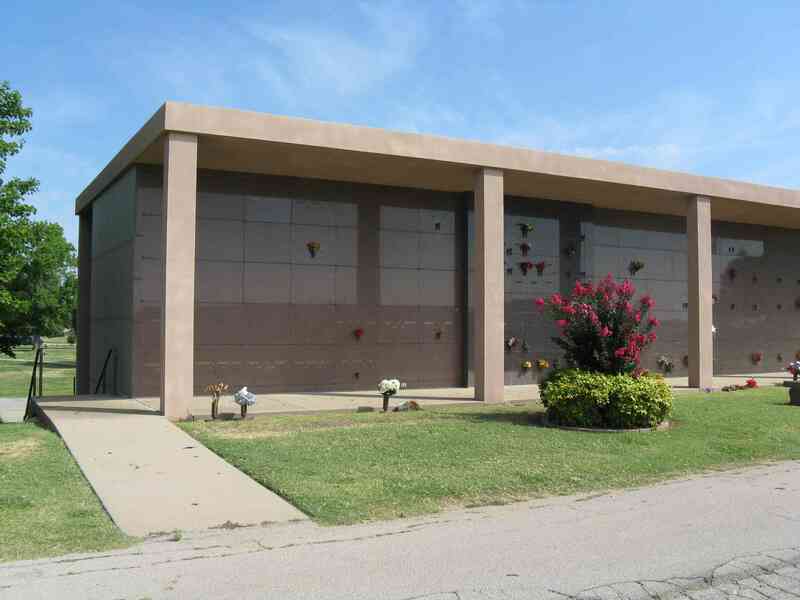 William also served as President of the Oklahoma branch of the Associated General Contractors in 1948. William apparently met his first wife, Bertha, after arriving in Oklahoma. Apparently after she died in 1963, he remarried to Mildred (Beattie) Phillips Cummings. Mildred died in 1974, and William in 1979. 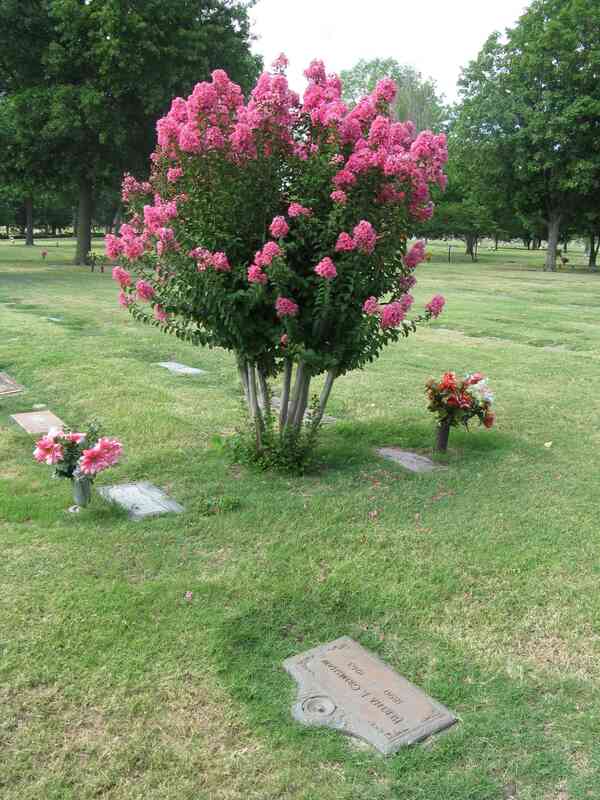 William and Mildred are buried in the same plot in Tulaa’s Memorial Park Cemetery. Bertha is buried in a separate plot in the same cemetery. William’s parents were James Frederick and Ettie M (Goode) Grimshaw. James was the great-grandson of Isaac and Hannah (Worrall) Grimshaw, one of the earliest well-documented Grimshaw couples to North America. They immigrated to New York City in 1805 and are the subject of a companion webpage. Isaac and Hannah Grimshaw were almost certainly descended from the Edward and Dorothy (Raner) Grimshaw family line in Yorkshore, although the direct link has not yet been established. 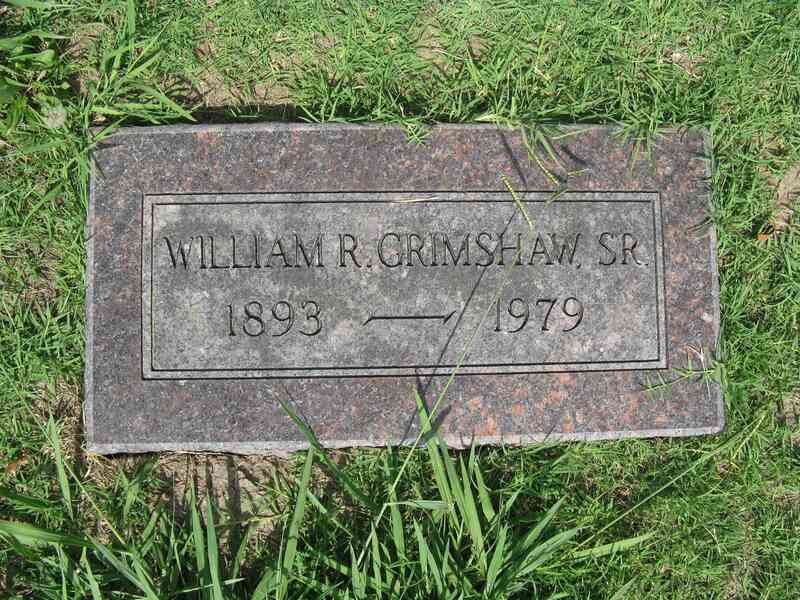 William and Bertha Grimshaw’s grandson, Harry Douglas Grimshaw, worked as a young man for W.R. Grimshaw Construction Company and later formed his own business, Grimshaw Homes Company, which continues in the homebuilding business in Broken Arrow, Oklahoma, although Harry passed away in 2008. Another grandson, Eric Grimshaw, is an attorney working in the Tulsa area. 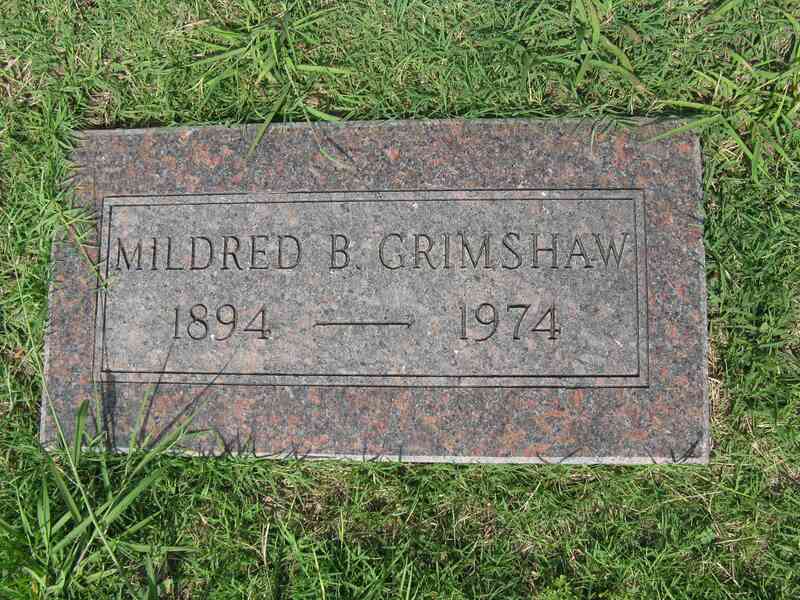 Where in Tulsa Did William and Bertha Grimshaw Live? Thanks go to Eric Grimshaw for contributing valuable information to this webpage. 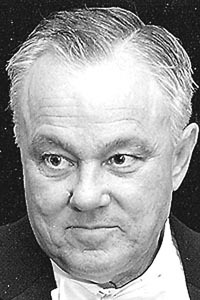 The photo shown below is labeled as “1968 Harry E Grimshaw” on a webpage showing Past Presidents of Associated General Contractors of Oklahoma, indicating he served in 1968. However, the photo filename is “Grimshaw W R Senior 1948”, making it highly likely that this photo is of William R Grimshaw rather than his son, Harry Douglas Grimshaw, and that he served in 1948. A newspaper record showing the William served as AGC president in 1948 is shown further down on this webpage. 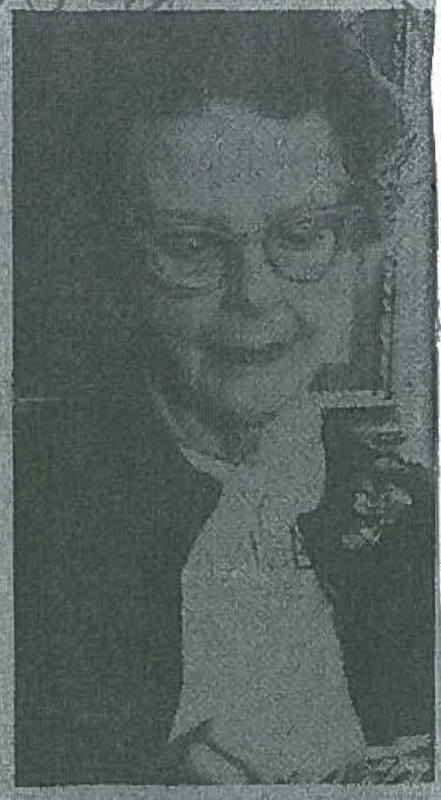 The following photo of Mildred (Beattie) Grimshaw is from her obituary, which is shown further down on this webpage. 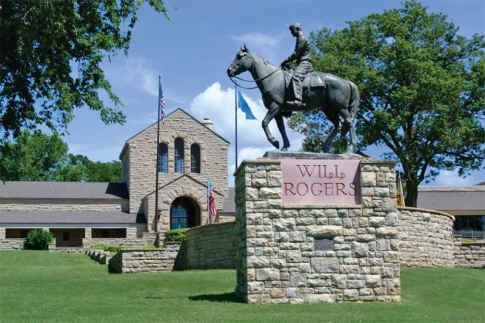 W.R. Grimshaw Company constructed the Will Rogers Museum in Claremore in 1938. The company also constructed the Tulsa Public Library, the LeFort County Courthouse, and other major structures in and around Tulsa. At one time the company apparently had offices in Oklahoma City and Denver. 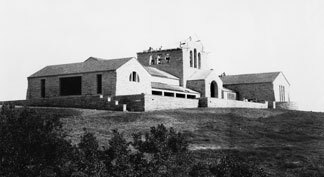 Will Rogers Museum, Constructed by WR Grimshaw Construction Company in 1938. 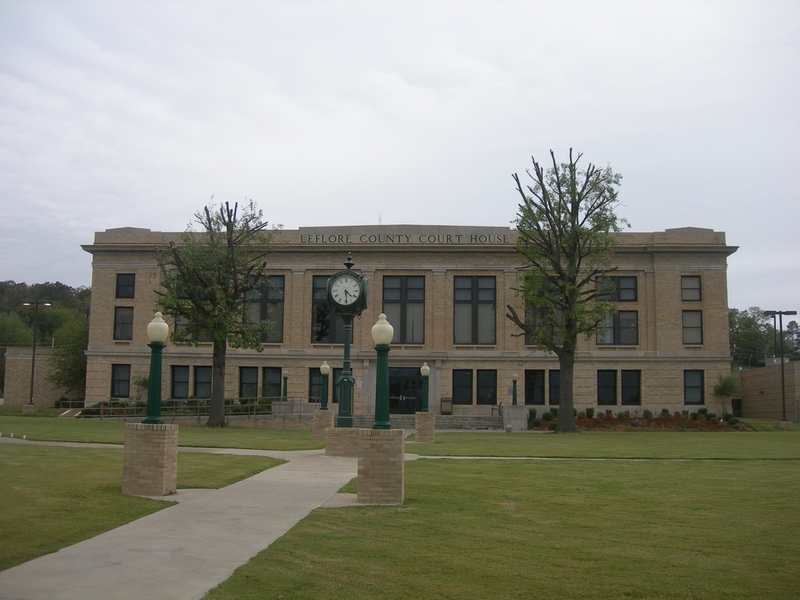 Photos of the Tulsa Library and the LeFlore County Courthouse are shown below. When Was Central Library Built? 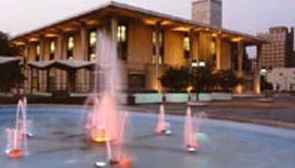 Central Library construction was completed in 1965. W.C. Roads was the engineer and W.R. Grimshaw was the general contractor. With built-in equipment, the building cost $1,864,111 or $13.76 per square foot. The total cost was $2,735,269. The building had: 135,443 square feet of gross floor area with room to expand another 65,000 square feet; open shelf capacity for 265,000 volumes; closed stack and storage capacity for 250,000 more volumes. Source Tulsa City-County Library 1912-1991, Okt 027.476686 L125t 1992. Poteau, Oklahoma Constructed between 1926-27 for $141,637 by WR Grimshaw Construction of Tulsa. 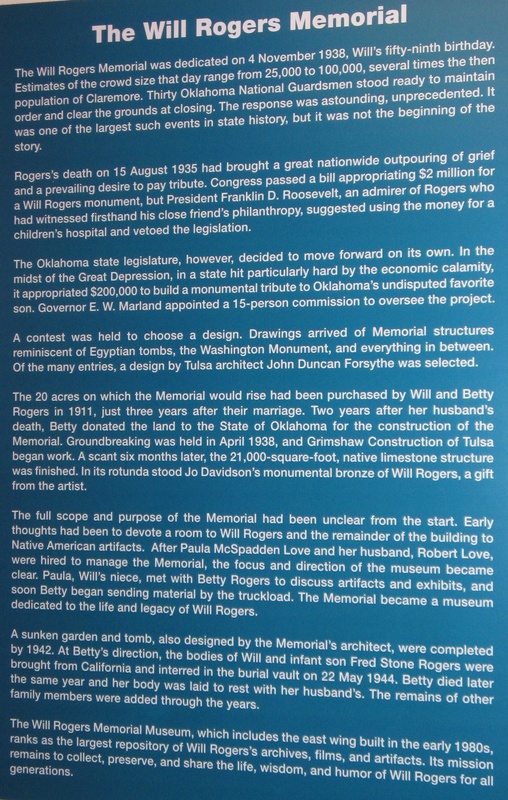 W.R. Grimshaw Company of Tulsa was chosen as contractor for the Will Rogers Memorial in Claremore and in less than a year after ground was broken April 21, 1938  on November 4  the museum was dedicated. Bonnie Grimshaw, daughter of Ray Grimshaw, well-known Tulsa builder, grew up in the construction business and often heard stories about her great-grandfather and his buildings. When she came to the Will Rogers Memorial on a field trip with her Jenks East Elementary third grade, she got two Oklahoma history lessons. She learned not only about Will Rogers place in Oklahoma history, but also about her great-grandfathers place in the history of the Memorial to Will. Oh my gosh, thats my name, she said she called out to her classmates when she saw an April 1938 photo of the groundbreaking of the Will Rogers Memorial. And there in that photo was her great-grandfather, W.R. Grimshaw, who had the contract for construction of the building. I bought all my class over to look at the picture, she said excitedly from her Las Vegas home, where she teaches third grade. As she toured the museum that day, she also saw the building dedication plaque with the Grimshaw name. Bonnie said growing up she heard a lot about buildings and projects of her great-grandfather. Before she came to the museum that day her mother told her W.R. Grimshaw had built the building she was visiting. I thought, OK sure. Its another one of these buildings, she said. It was that visit that gave her a greater appreciation for her fathers place in building business history and a lesson about Will Rogers she never forgot. Bonnies father, who died earlier this year, worked for his grandfathers company during his school years. He was proud of his grandfathers role in building Tulsa and Oklahoma, according to his wife, Jane. In 1977 Ray Grimshaw founded his own company, Grimshaw Homes, named Number 1 builder in Broken Arrow five consecutive years from 1999 to 2003. Eric Grimshaw, another grandson, knew of his grandfathers involvement in the museum construction and visited as a child and as an adult. He has an autographed photo of Will Rogers and Waite Phillips that was among his grandfathers possession, handed down to Rays mother and later given him. Interested in keeping the family history, Eric thinks his grandfather knew Will Rogers before his death, perhaps through the Phillips connection. Bonnie Grimshaw Pataonai and her new husband, came from Las Vegas the family for the Will Rogers Days celebration. Eric and his daughter, Paige, and his sister, Kristin, joined the family gathering. 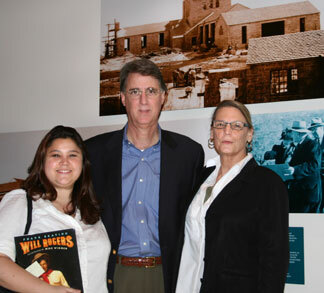 Family of the late W.R. Grimshaw came to Claremore for the 70th anniversary of the Will Rogers Memorial Museum opening . Great-grandaughter Bonnie Grimshaw Pataonai came from Las Vegas to join grandchildren Eric Grimshaw and Kristen Grimshaw of Tulsa. Larry Lantow is linked to Will Rogers and the Will Rogers Memorial in unique ways. His family moved to Claremore in 1934 and his father ran the King-Lawrence Lumber Company (later Lawrence Lumber and Everett Lumber), east of the Missouri Pacific railroad tracks in downtown Claremore. W.R. Grimshaw, general construction contractor for Will Rogers Museum, purchased lumber from his father. The old man Grimshaw was really a great man, he said. He has fondest recollections of the summer of 1934 when Will Rogers  during a summer band concert at the bandstand below Oklahoma Military Academy spoke to homefolk about a trip to Russia. Lantow attended Oklahoma Military Academy Junior College in the classes of 1936-37 and 1937-38, so was gone when the OMA band played for the Nov. 4, 1938 opening. True the tradition of the male members of his family, Larry Lantow spent four years in the U.S. Army. Two of his brothers perished during World War II. Bob and Norman were paratroopers and dropped down D-Day in France. Bob died in battle six days later. Norman went on to be shot and captured, then rescued and sent to England to recuperate  and later died in Holland. Brother, Bill, who lives in Claremore, served during the Korean conflict. The Lantow names lives on in the name of the Claremore Zebra football field and stadium, especially honoring his brothers who died in service of their country. There were two sisters, the late Betty Nickerson, and Donna Fettig, who lives with her husband in Omaha. After earning a degree in business management and accounting, Larry liked Hope Lumber and continued to work there, eventually becoming manager before retiring in 1982. At 91, he still makes his home in Tulsa. He was in his element recently when former OMA cadets gathered for a reunion opening event at the Will Rogers Memorial and he looked around remembering 70 years and many changes ago. Announcement of the contract award appeared in the December 6, 1936 edition of the Daily Oklahoman. A partial transcription is shown below the image. Contract for construction of the memorial museum near Claremore in tribute to Will Rogers was let to W.R. Grimshaw Co., Tulsa, for $… by the Will Rogers Memorial committee Tuesday. John Duncan Forsyth, architect, said the contract can be signed in few days and initial construction will start in about a week. It is planned to have the memorial completed by November 4, birthday of the late …, for the … and unveiling of a … statue … by …, … sculptor. The statue will be six feet and four inches in height and stand at the entrance of the …, ranch-type memorial. This statue will be cast from the … in statuary hall in Washington. The $… for construction … appropriation for building the memorial. The following description of the memorial is from an exhibit located inside the main building. Note the reference to Grimshaw Construction in the fifth paragraph. Photo taken by website author July 2013. 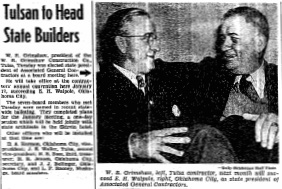 The Daily Oklahoman carried the following article on William Grimshaw’s election to president of the Oklahoma AGC on December 17, 1947. His term began on January 21, 1948. A partial transcription is shown below the photo. W.R. Grimshaw, left, Tulsa contractor, next month will succeed E.M Walpole, right, Oklahoma City, as state president of Associated General Contractors. William was born on December 6, 1892, as shown on following record from FamilySearch. The 1920 and 1930 U.S. Censuses found William R and Bertha Grimshaw living Tulsa, with William having been born in New Jersey in 1891. William was age 28; born in New Jersey. William was born in 1891 in New Jersey. William and Bertha lived at 1920 East 6th Street as indicated in the 1929 Tulsa City Directory. By 1930, they had moved to 1520 East 24th as shown in the City Directory for that year. 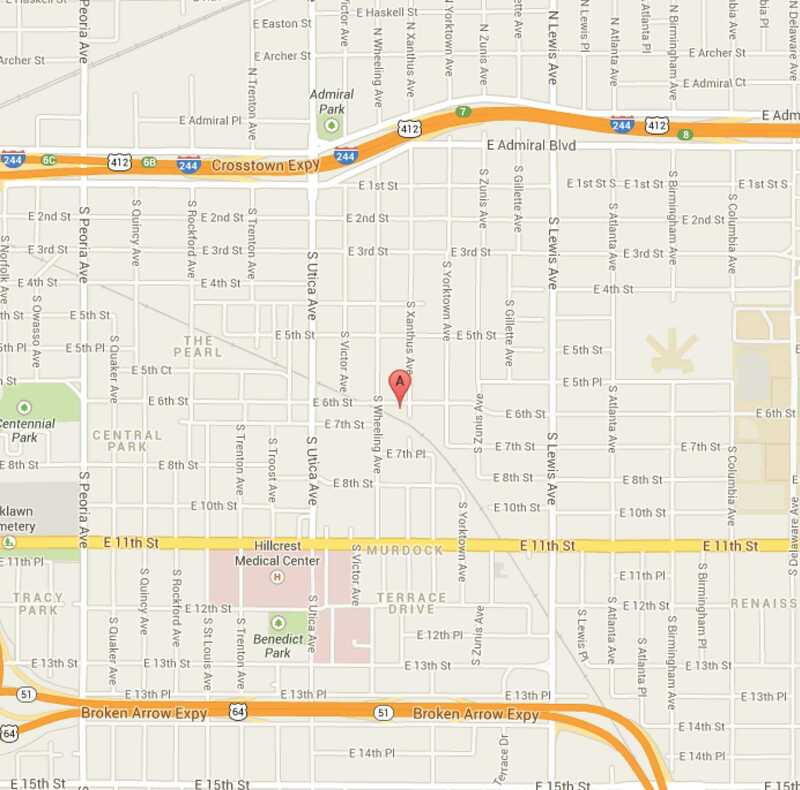 Maps showing the location of the earlier home are shown below. William Grimshaw’s ancestry has been determined from several sources as shown below. Ray D Grimshaw sent the letter shown below to Edwin A Grimshaw in 1980 in response to a mailout by Ed Grimshaw in that timeframe. 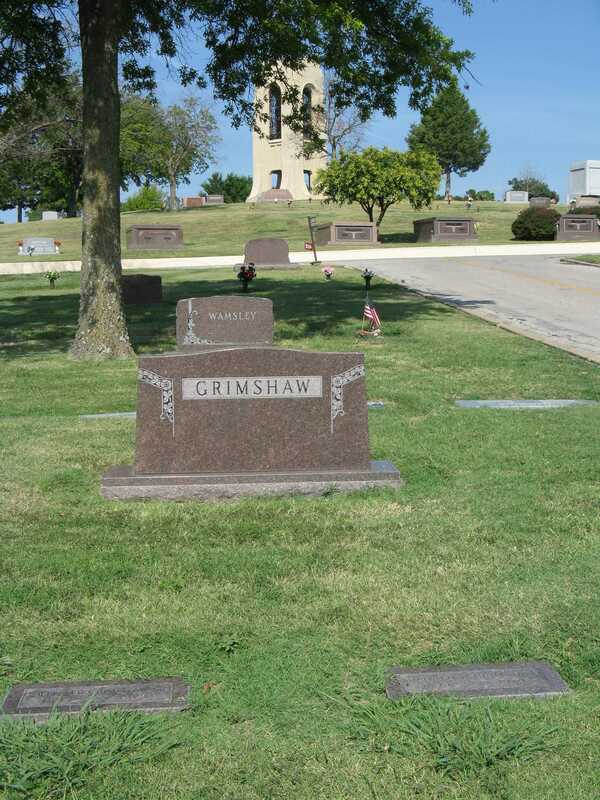 I dont believe I am directly related to your Grimshaws. The following descendant chart for William R and Bertha Grimshaw can be prepared from the above information on this webpage and information provided by Eric Grimshaw. |—-William R. Grimshaw (26 Apr 1918 – 12 May 1993) & Dee Dee ? |—-|—-Ray Douglas Grimshaw (25 Dec 1945, Stillwater, OK  22 Jan 2008, Tulsa, OK) & Jane Scisson. Married 28 Feb 1976. |—-|—-|—-Bonnie Elizabeth Grimshaw & David Michael Patonai. Married 21 Jun 2008. William R Grimshaw’s ancestry was provided by Eric Grimshaw as shown below. Thanks go to Eric for sharing this invaluable information. |—-William Grimshaw & Elizabeth ? The Piccarelli Public Family Tree on Ancestry.com provided information that enabled William Grimshaw to be connected to the Isaac and Hannah (Worrall) Grimshaw family line. Isaac and Hannah are among the earliest well-documented immigrant Grimshaw families. Isaac Grimshaw is almost certainly descended from the Edward and Dorothy (Raner) Grimshaw family line in Yorkshire. The connection of William Grimshaw to Isaac and Hannah Grimshaw on the Piccarelli tree is through William and Mary Elizabeth( Foster) Grimshaw and is shown below with additional information on William and Mary Grimshaw and their descendants. 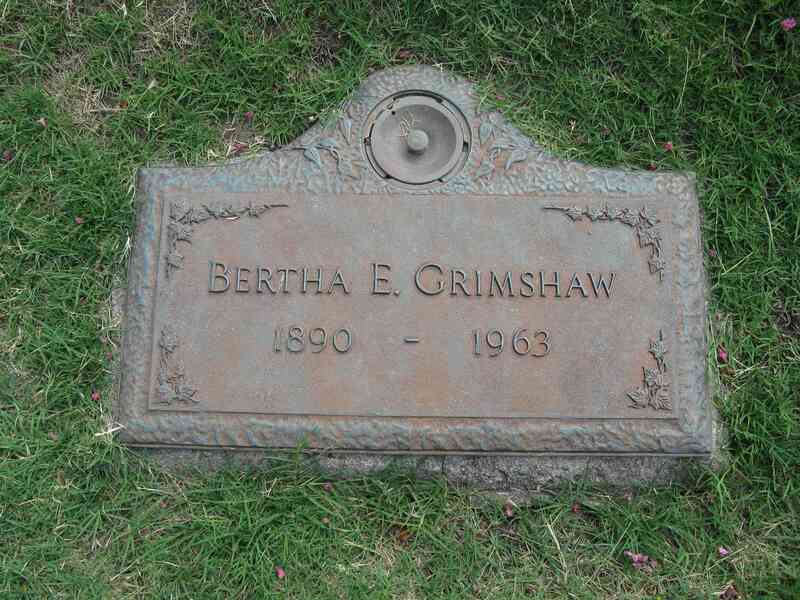 Information from the Edward and Dorothy Grimshaw webpage is also added. |—- Joseph Henry Worrall Grimshaw (10 Oct 1796 – 1877) & Caroline Mason (abt 1807, New Orleans, LA – ?, Brooklyn, NY). Married 15 Apr 1827. |—-|—- Isaac James Grimshaw * (31 Jul 1830 -1899) & Susan Franklin (1835-1918). Married 24 Dec 1865. |—-|—-|—-William Augustus Grimshaw (1834, New York City – ?) & Elizabeth A ? (June 1861, NY – ?). Married 1885. Based on the above information, the following expanded ancestor and descendant chart can be constructed for William Grimshaw (shown in bold in the descendant chart below). Information is also added from the Croul Public Family Tree on Ancestry.com (http://trees.ancestry.com/tree/20173549/person/907891108). |—-|—-|—-James Frederick Grimshaw (4 Dec 1861, NY – 15 Dec 1945) & Ettie M Goode (22 Apr 1864 or 67 – Dec 1921). Married 25 Jan 1890, Allegheny, PA.
|—-|—-|—-|—-Gertrude Anne Grimshaw (10 Jun 1896, Rutherford, NJ – Aug 1985, Corona Del Mar, CA) & Charles Rexford Croul (4 Sep 1885, Kansas City, MO – 6 Feb 1954, San Marino, CA). Married 18 Nov 1920, NJ. |—-|—-|—-|—-|—-William Raymond Grimshaw (26 Apr 1918 – 12 May 1993) & Dee Dee ? |—-|—-|—-|—-|—-|—-Ray Douglas Grimshaw (25 Dec 1945, Stillwater, OK  22 Jan 2008, Tulsa, OK) & Jane Scisson. Married 28 Feb 1976. |—-|—-|—-|—-|—-|—-|—-Bonnie Elizabeth Grimshaw & David Michael Patonai. Married 21 Jun 2008. |—- Angelina Snowden Grimshaw (1807, New York City – ? ). Died in infancy. Ray Douglas Grimshaw, grandson of William R and Bertha Grimshaw, worked for his grandfather as a young man and in 1977 formed his own company, Grimshaw Homes, which appanrently continues in operation. Ray passed away in 2008. An obituary with photo in Tulsa World is shown below. 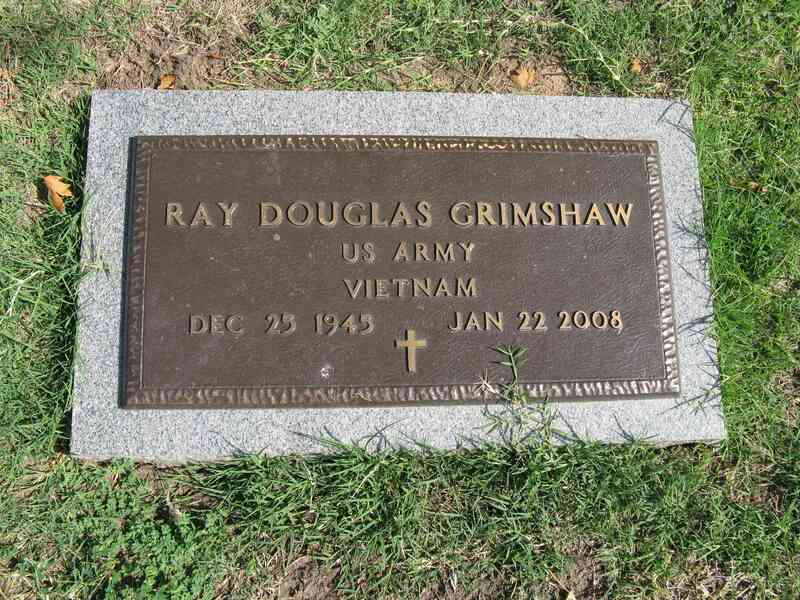 GRIMSHAW – Ray Douglas, born December 25, 1945 in Stillwater, OK to Harry Douglas Grimshaw and Rebecca Darby Grimshaw passed away suddenly on Tuesday, January 22, 2008. Ray grew up in Tulsa, graduating from Cascia Hall Preparatory School where he was president of the senior class. He graduated from the University of Arkansas with a Bachelor of Science degree in Business Administration in January, 1969. He had been a member of the Sigma Nu fraternity. After college, he served in the United States Army stationed in Germany. During his school years, he worked during the summers for his grandfather’s company, W.R. Grimshaw Construction, on various building projects around Tulsa such as the downtown City-County Library. After his Honorable Discharge from the Army, he worked for various construction firms until 1977 when he founded a home building company. At the time of his death, he served as President of Grimshaw Homes Company and served on the board of Directors of the Homebuilders Assoc. of Greater Tulsa. He participated regularly in the Parade of Homes. He and his wife enjoyed traveling and playing golf. He was a member of Southern Hills Country Club. Ray is survived by: his wife of 31 years, Jane Scisson Grimshaw; and 2 daughters, Bonnie, a 3rd grade teacher in Las Vegas, and Robin, a student at OSU-Tulsa. He is also survived by: his cousins, Eric Grimshaw, Kristen Grimshaw, Paige Grimshaw, and Rick Grimshaw; his aunt, Lucille Darby; and step-mother, Bobbie Grimshaw. His service will be held at 11 a.m., on Saturday, January 26th at St. Johns Episcopal Church, Tulsa. Burial will be at Memorial Park Cemetery, immediately following the service. The family is requesting that contributions be made to St. John’s Episcopal Church. 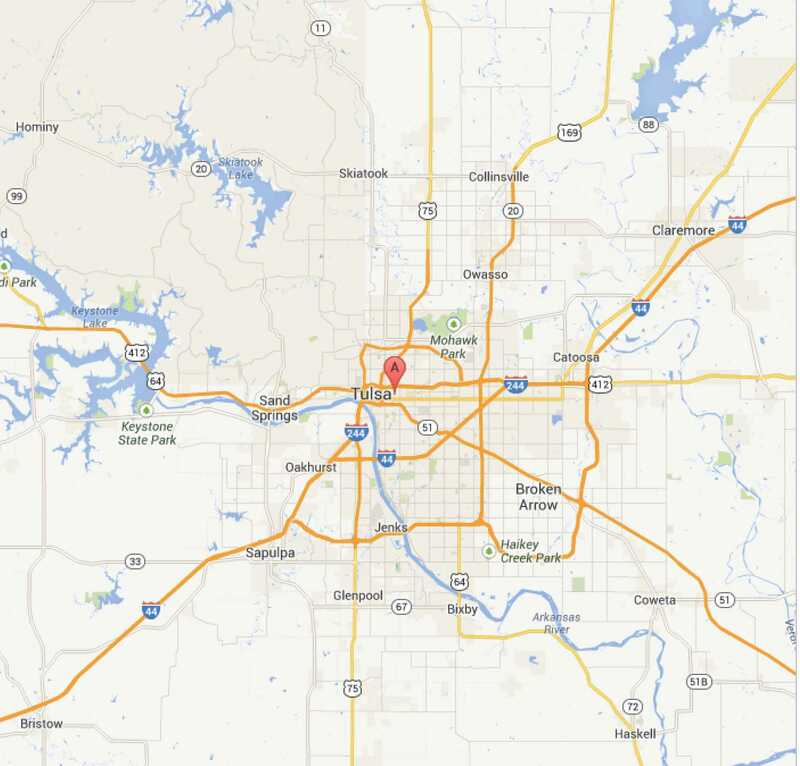 Since 1977, Grimshaw Homes Company has constructed over 1000 homes for satisfied customers in the Tulsa area. With over 30 years in the home building industry, Grimshaw Homes Company has established a company focused on quality, attention to detail, & the customer. Grimshaw Homes Company realizes building a new home is one of the most important decisions you will ever make. We build well-designed, beautiful homes in great communities to offer you better living. Grimshaw Homes Company has been building with integrity and commitment for over 25 years. Grimshaw Homes Company was founded in 1977 in Tulsa, Oklahoma and has been providing quality homes ever since. Our homes are designed from a practical, yet personal perspective – yours. We listen to our customers, identifying their needs and evolving our products to meet them. We offer highly desirable standard features, a long list of options and a variety of fresh floor plans with quality products from the industry’s most respected manufacturers. Grimshaw Homes Company has been one of the major builders in metropolitan Tulsa over the years and was the number one builder in Broken Arrow for 5 consecutive years (1999-2003). The Company has received numerous awards during Parade of Homes, including awards for Best Floor Plan and the WOW! Factor Award for Bonus Room. Grimshaw Homes Company is currently building in Broken Arrow within 2 carefully planned communities: Renaissance Park & Bel Lago. We are dedicated to providing beautiful homes in great communities, therefore our customers have better living. All homes are complete with an extensive range of amenities. All subdivisions have been well designed offering such features as a pool, park, & sidewalks and are conveniently located near major interstates. Conveniently located near Bass Pro Shop, Lowe’s, Chili’s, Los Cabos Broken Arrow and Target. Several favorite restaurants will be coming soon, such as: Hideaway Pizza and Olive Garden. Prices vary depending on subdivision and are subject to change. Please visit us in each subdivision to preview our homes. 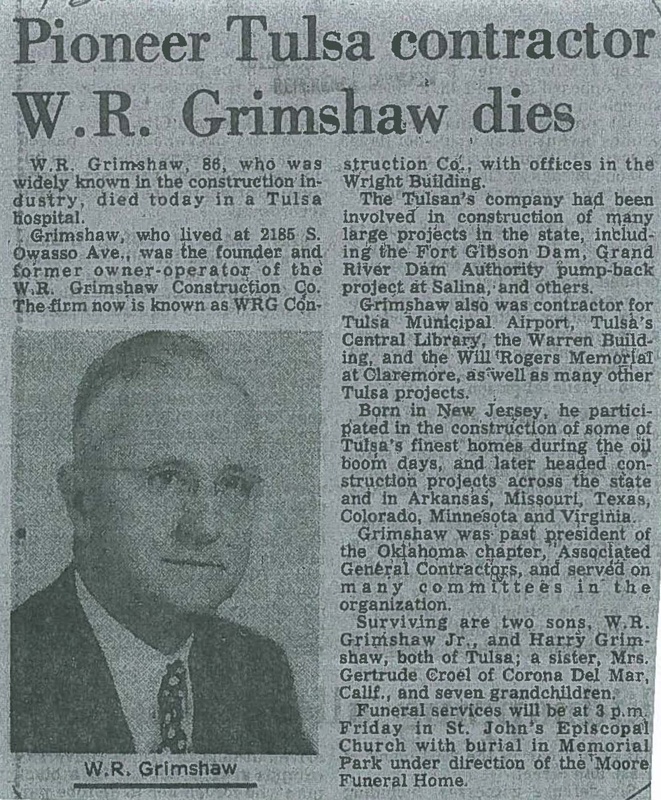 The following obituary of William Grimshaw appeared in the March 7, 1979 edition of the Tulsa Tribune. 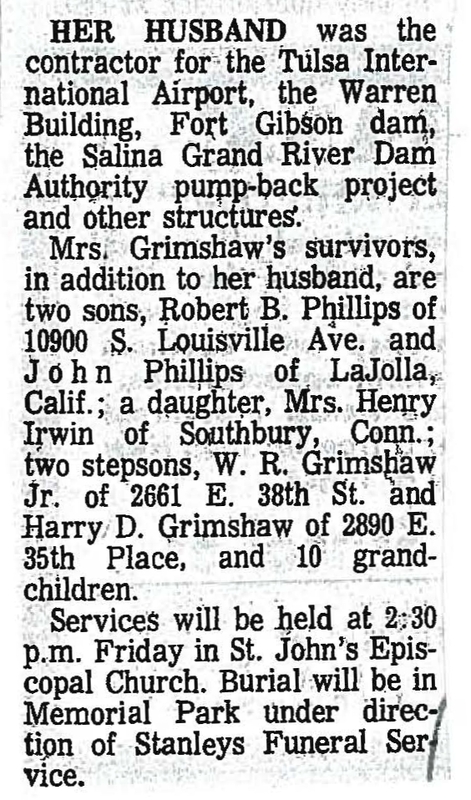 The following obituary of Mildred Grimshaw, second wife of William, was in the Tulsa Tribune, September 12, 1974. 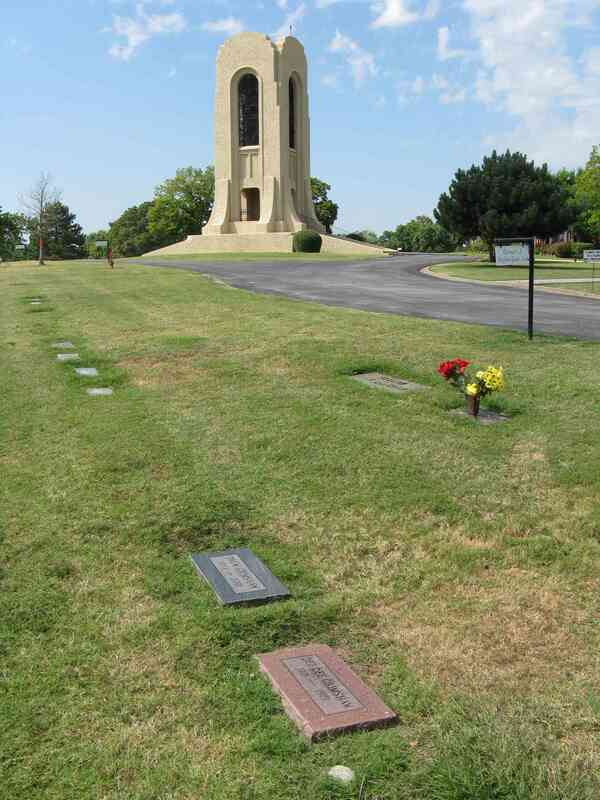 William and Mildred’s headstone and gravestones are shown below with the bell tower in the background in Memorial Park Cemetery in Tulsa. 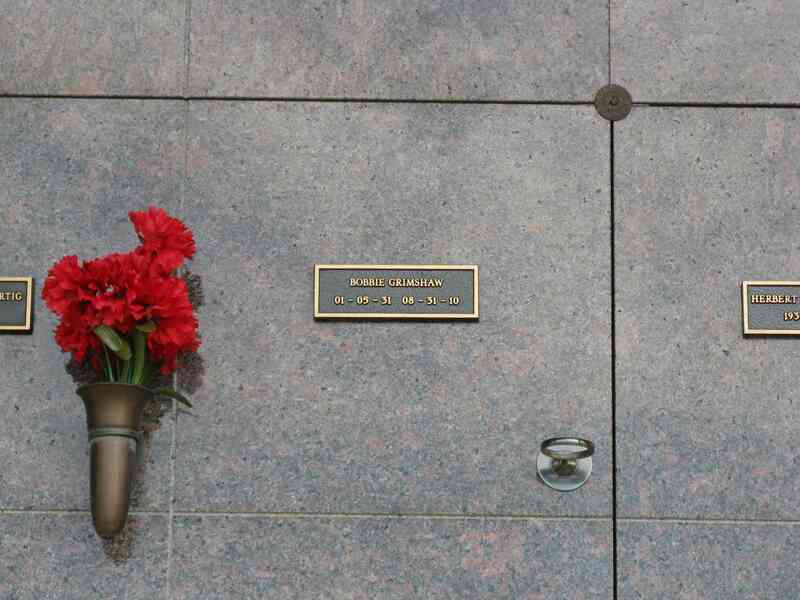 The individual gravestones are shown below. The gravestone of William Grimshaw’s first wife, Bertha, shown below, is in another plot in the same cemetery. 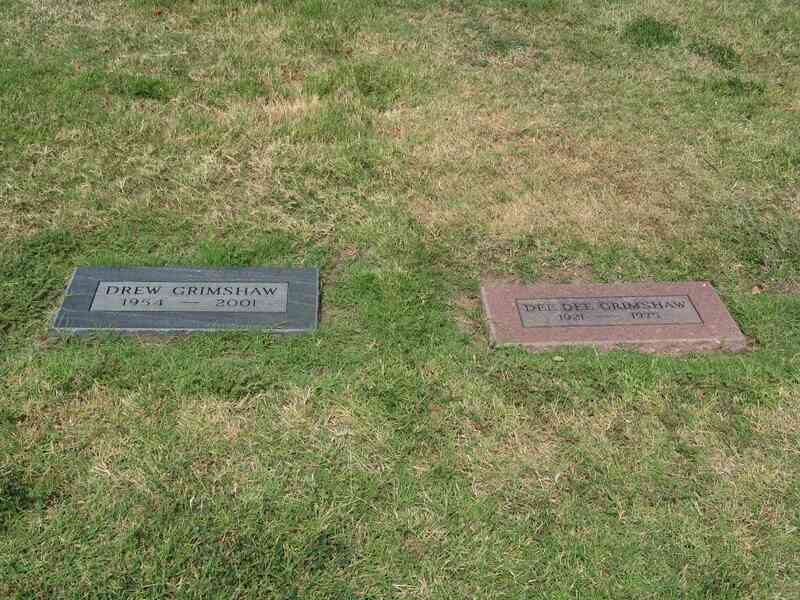 The grave markers of DeeDee Grimshaw, wife of William’s older son, William Raymond Grimshaw, Jr, with her probable son, Drew Grimshaw, are shown below. The gravestone of Harry Douglas Grimshaw, William Raymond Grimshaw’s grandson, is shown below with the crematorium marker of or his second wife, Barbara (“Bobbie”) (Marquis) Grimshaw. Coincidentally, Converse Grimshaw, son of Frank and Edith Grimshaw, lived in Tulsa and died there in 1994. Converse was from the Frank Barstow Grimshaw family line, which is described on a companion webpage. Webpage posted December 2008. Updated March 2010 with addition of obituaries, photos, and explanatory text. Updated July 2013 with ancestor and descendant information from Ancestry.com. 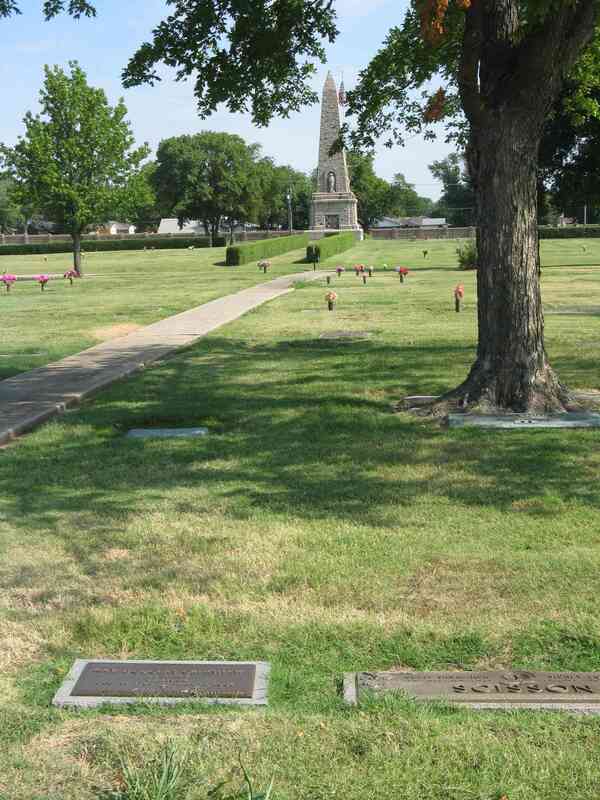 Updated again July 2013 with grave photos and information from Tulsa library obtained during site visit to Tulsa.